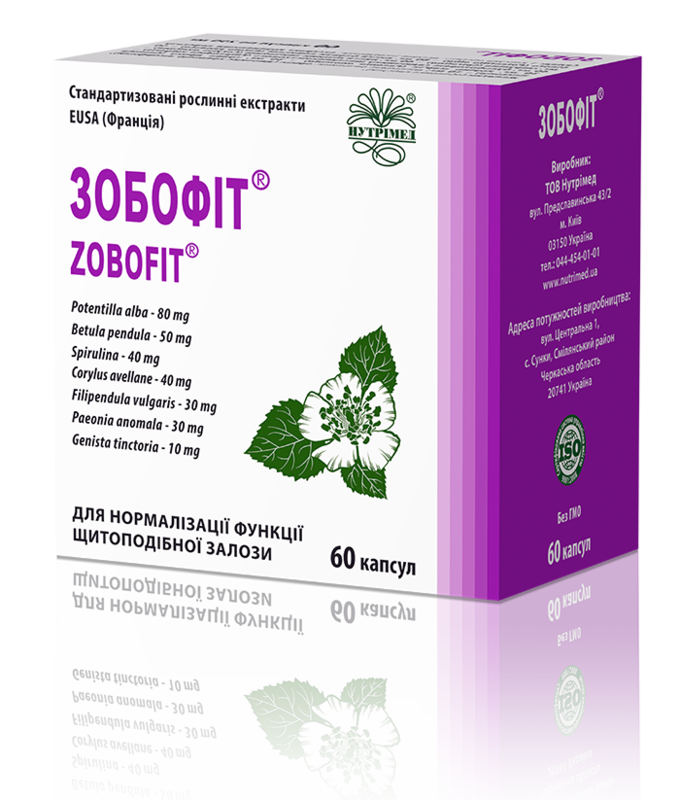 The components of ZOBOFIT® have thyrotropic, antioxidant, anti-inflammatory, immunomodulating, antiproliferative and sedative effects. Due to the carefully selected and well-balanced composition of herbal components, the ultimate effect is greater compared to the use of monotherapy in higher doses. ZOBOFIT® has a normalizing effect on the thyroid gland in cases of both hypo- and hyperthyroidism. NUTRITIONAL AND ENERGY VALUE (CALORIC VALUE) PER 100 g OF THE SUPPLEMENT: proteins – 35.75 g, carbohydrates – 6.33 g, fats – 0 g; 173 kcal (723.8 kJ). RECOMMENDATIONS FOR USE: ZOBOFIT® is recommended as an additional source of natural iodine and its compounds, other minerals and biologically active substances to normalize thyroid gland functioning in persons with thyroid impairment, namely: in autoimmune thyroiditis, hyper- and hypothyroidism (including postoperative), endemic and diffuse goiter, euthyroidism, thyroid hyperplasia. It helps normalize the total volume of the thyroid gland and restore its structure. METHOD OF ADMINISTRATION AND RECOMMENDED DAILY DOSE: adults should take 2 capsules 1-3 times daily swallowed with drinking water. The treatment course is 2-3 months. The course can be repeated if needed. CONTRAINDICATIONS: pregnancy and lactation, individual sensitivity to any ingredient. PHARMACEUTICAL FORM: capsules with the contents weight of 290 mg ± 5%. Терапевтическая коррекция аутоиммунного тиреоидита с гипо- и гиперфункцией щитовидной железы.Кравчун Н.А., Казаков А.В., Чернявская И.В. Проблеми ендокринної патології.- 2010.- № 3. Клинический опыт применения фитопрепарата Зобофит в терапии аутоиммунного тиреоидита. Український медичний часопис. № 4 (78) VII-VIII 2010. Зобофит: с заботой о щитовидной железе. Аптека. – 2010. – № 743, июнь.